A hip stress fracture is a serious injury to the ball of the ball-and-socket hip joint. You may think of broken hips only in the elderly, but stress fractures can happen at any age. Stress fractures are injuries to the bone that result from overuse activity. A stress fracture is due to repetitive micro-trauma to the bone. Over time, the body cannot keep up with the forces acting on the bone, and a fracture eventually occurs. It differs from a high-energy hip fracture due to a fall or a pathologic fracture due to osteoporosis, tumors, or infections. People with a hip stress fracture are most often high-mileage runners, military recruits, or individuals doing significant impact sports activities. These athletes will typically complain of an aching groin pain that bothers them with activity and is relieved by rest. Symptoms are usually noted after a recent increase in the level of activity, such as increasing running mileage. After a stress fracture, the bones often maintain their proper alignment. In fact, these fractures are sometimes not even visible—especially in the early stages—on a regular X-ray. However, if the stress fracture is left untreated, and the bone continues to weaken, the fracture can displace, or cause the bones to go out of alignment. Hip stress fractures are particularly concerning if the bones are displaced (move out of alignment). If this happens, the blood supply can be cut off, leading to bone death and the development of hip osteonecrosis. For this reason, doctors often get very concerned when they suspect a stress fracture of the femoral neck in the hip. When one is suspected, the doctor will usually ask their patients to use crutches until the necessary diagnostics tests are complete. In the situation of a stress fracture, repetitive injury to the bone eventually leads to failure of the bone or fracture. Normally, bone is constantly undergoing a cycle of turnover during which old bone is reabsorbed, and new bone is created. If the process cannot keep up, eventually the bone can fracture. Hip stress fractures most often occur just below the ball of the ball-and-socket hip joint. This location of the bone is called the femoral neck. Stress fractures can occur in other areas of the hip and pelvis, but the femoral neck is the most common and most concerning location for a hip stress fracture. If a hip stress fracture is suspected, an X-ray will be performed. While some hip stress fractures will be seen on X-ray, some X-rays may appear normal. If the injury is still suspected, an MRI or bone scan can also be obtained to evaluate for a stress fracture. Hip stress fractures require the immediate cessation of activities that place stress on the joint. Doing so can also significantly reduce pain or discomfort. If a stress fracture is suspected, pain medications should be avoided until the fracture has been treated. Doing so before then can mask symptoms and lead to a more serious break. If you only have pain when running, then the running must be stopped. If the pain occurs while walking, then crutches should be used. The important concept is to stay under the level of pain. If you avoid activities that aggravate your symptoms, then it is often possible that hip stress fractures will heal without surgery. Surgery is needed if there is a concern that the fracture may displace. This is often considered if the break is significant and located on the femoral neck which is less apt to heal on its own. The specific location of the fracture can help your doctor to determine the best course of treatment. Hip stress fractures that lead to compression tend to be more stable than those that occur where the bone is under tension. Your doctor can determine if the stress fracture is stable based on the X-ray and MRI results. Hip stress fractures can be very serious injuries that require immediate treatment. 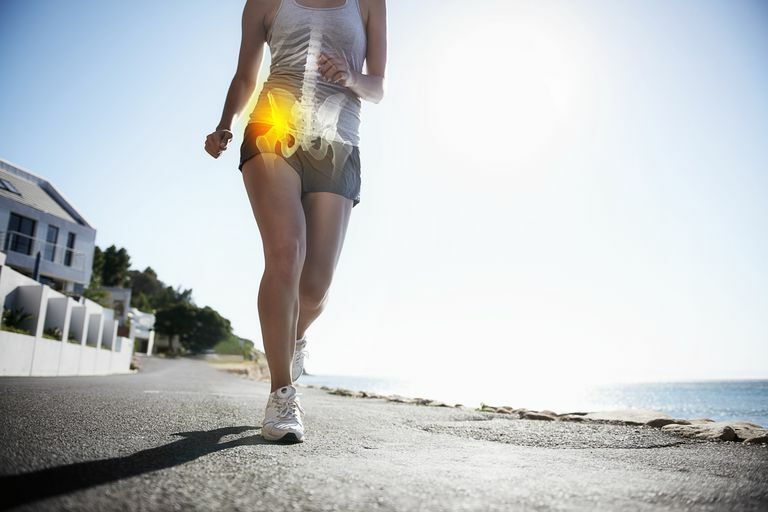 While not every hip stress fracture will require a surgical treatment, immediate modification of activities in order to relieve symptoms is a necessity. Neglected hip stress fractures can lead to serious problems, most notably the displacement of the fracture that would require surgery, and could lead to serious complications, including hip osteonecrosis. What Are My Odds of Recovering From a Broken Hip? Boden BP, Osbahr DC. "High-risk stress fractures: evaluation and treatment" J Am Acad Orthop Surg. 2000 Nov-Dec;8(6):344-53.